Fancy giving Scuba Diving a go? Our Discover Scuba Diving is a half day program for people who wish to try scuba diving with a minimal time and money spent. You don’t need any previous experience but some basic swimming skills are desirable. The goal is to give people a chance to experience the amazing world they are missing. 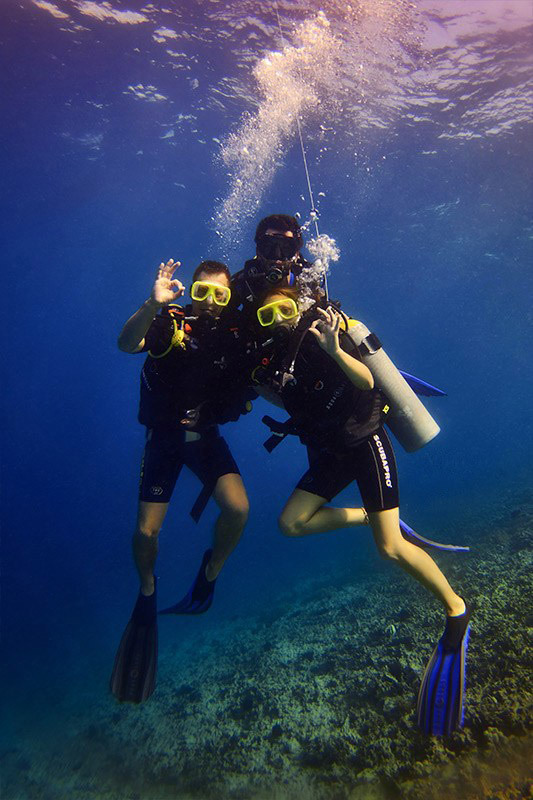 The program includes a basic dive theory, a session and an open water reef dive with an instructor. The confined water practice session is executed in one of our two swimming pools. The open water that follows is done on one of many suitable dive sites for beginner level divers. The maximum depth for this program is 12 meters. We like to keep our group sizes very small, there will no more than four divers per instructor. We have a professional photographer available on each dive trip for great memories. You can get the photos for a small additional fee. This Introduction Dive program will be credited towards your Open Water Diver course if you continue to dive with our facility. Should you choose to sign up for the full course you will receive a 900,000 IDR discount from the course fee.